Jimmie Johnson is somewhere in New York City today, doing the media rounds befitting the latest Daytona 500 winner. Then it's on to Dallas, probably Chicago and San Francisco too, on his whirlwind way to Phoenix for next weekend's second race of the stock car racing season. While Johnson chats it up -- his second victory in the sport's biggest event, and a much better launching pad toward a sixth Sprint Cup title than his last five beach 500s -- let's review what we saw this SpeedWeeks....and what we didn't see. What we saw in the 500 itself was a single-file parade. For over three hours. Virtually no drama. Virtually no passing. Little buzz. Maybe it's been lost somewhere along the way here, but NASCAR racing isn't about just winning races and winning championships. It's about entertaining the fans. This is supposed to be entertainment. Maybe somebody didn't get that memo. Well, Friday's night's Truckers sure made it happen...and so did Saturday afternoon's Nationwide racers. But when it came time for the big show, with the highly touted new 2013 stockers, it was Dullsville. Maybe drivers were shaken by Saturday's big crash, yes. 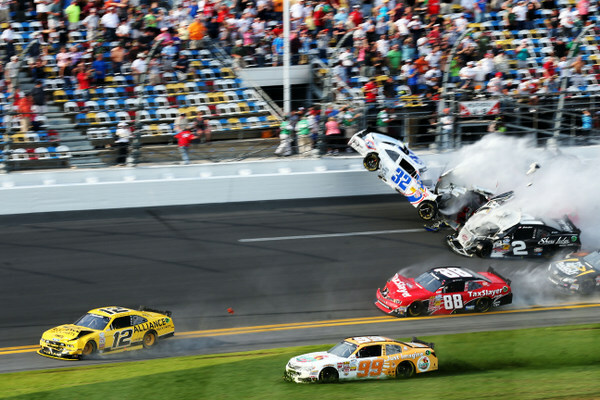 But Cup drivers were driving their 2013s single-file right from the opening day here, and things didn't change: single-file, high-line rules. Anyone daring to try to pass low side was toast....or worse, as Carl Edwards showed. Consider Carl Edwards here now. When one of the tour's best drivers crashes out five times -- FIVE times -- it's fair to say there is a major issue here to consider. NASCAR execs have all but forbidden public criticism of these new 2013 model stockers. The heavy-hand was clear in NASCAR's Friday night meeting with Brad Keselowski for expressing his views about aspects of this sport. Maybe some NASCAR execs have their priorities too skewed. Privately drivers pointed to what they described as significant aerodynamic issues with this new race car. Several complained that NASCAR took away too much rear downforce from the 2013s, apparently to keep drivers from teaming up in two-man packs (though two-man drafting was clearly used in both Nationwide and Truck races). 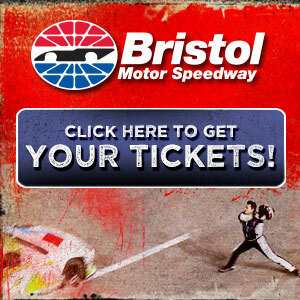 Now things may be quite different in the coming weeks at Phoenix, Las Vegas and Bristol. But the Daytona 500 is this sport's biggest race, the kickoff to the season....and to be blunt it wasn't much of a show, there wasn't much 'entertainment' here Sunday afternoon. Johnson's assessment: "When we're running single-file, we're just trying to get to the finish. We've all crashed so many times and torn up so much stuff that a lot of that falls on the driver's shoulders. "There were a few guys willing to race (during the 5000. The spotters were all talking, and I'd get word that three or four guys wanted to jump out of line, they were tired of riding. I thought they better get some friends. "A lot of the competitors just wanted to get to that last pit stop and race for it." That was clearly the game plan after Tony Stewart, Kasey Kahne, Kevin Harvick and other got caught up in a crash 80 miles in. It was certainly apropos that part of the pre-race music included Orff's Carmina Burana 'O Fortuna.' The fickle finger of fate award this weekend goes to....Carl Edwards. 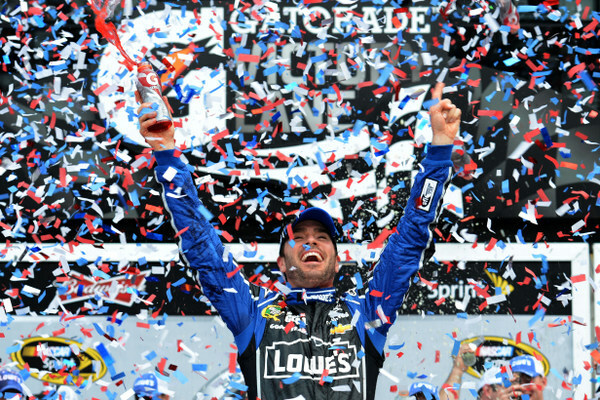 Now it's difficult to image Jimmie Johnson, this five-time NASCAR champion, now with 61 career tour victories, 'flying under the radar.' But this SpeedWeeks he did. But then, heck, his luck at plate-racing, over his career, just hasn't been that great. "Plate racing, man, it's like playing the lottery: Everybody's got a ticket," Johnson says. "When David Reutimann (driving for one of the underfunded teams) is up there running fifth or sixth in the closing laps, it just shows you how equal the cars are and what the draft does. up race cars. Today we had a clean day. "I didn't doubt our ability to win. I was just frustrated with circumstances and plate racing. "This will buy me a smile for the rest of the year on the plate tracks." This SpeedWeeks was all Chevrolet, and the GM army wasn't bashful about it. GM president Mark Reuss was all over the place. And the mood in rival Ford and Toyota camps was almost sullen. Toyota's only talking point was Kyle Busch's victory in one of Thursday's 150s...but that came only after NASCAR penalized leader Jeff Gordon for speeding on pit road. And in the 500 Team Toyota took a big hit with Busch blew an engine and Matt Kenseth tore up a transmission. Ford's only talking point was Greg Biffle. And, though having a strong car, Biffle was never able to make a move on a leader during SpeedWeeks. Johnson and teammate Dale Earnhardt Jr. made it a one-two finish for Chevy's top owner, Rick Hendrick, and it marks the seventh time Hendrick has been to Daytona 500 victory lane. Chevy drivers took six of the top-10 spots. Johnson's win was Chevrolet's seven in the last 11 Daytona 500s. The crowd here was good. The stands hold about 167,000 and were mostly full. Traffic moved very smoothly after the race. -- the 'Overnight' Rating (average of largest 56 US markets) was a 10.0. If that holds up nationally (and it would likely increase a bit), it would mark the first time since 2008 that the Daytona 500 has pulled a 10.0 rating. -- that was up 30 percent over last year's rain-delayed 7.7. On the other hand, last year's Daytona 500 drew the second-lowest ratings since 1995, second only to 2010's Pothole 500. -- the top US market was, as usual, Winston-Salem/Greensboro NC, with a 21.2 rating. -- Fox said the race 'opened' with an 8.6 rating from 1:30 p.m. ET to 2 p.m. ET, and it peaked at 12.8 from 4:30 p.m. ET to 4:45 p.m. ET for the conclusion. 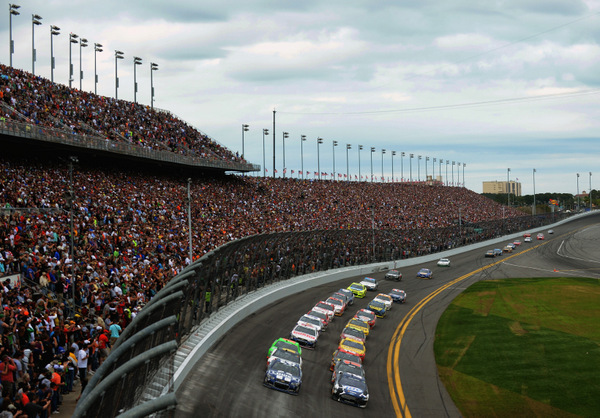 To put this in some perspective, the most popular recent Daytona 500s were the 2006-NBC/Olympics 500, won by Johnson; the 2005 race, won by Jeff Gordon; the 2002 race, won by Ward Burton; the 2004 race, won by Dale Earnhardt Jr.; and the 1979 Daytona 500, won by Richard Petty, as Cale and Donnie and Bobby duked it out over in T3. That 2006 Daytona pulled the biggest TV numbers of all time, with 19.3 million viewers, according to NBC, with an 11.3 rating. Much of the punch about this race was about Danica Patrick, after winning the pole. She lived up to the hype (something she hasn't generally done during her time in NASCAR), became the first woman to lead the Daytona 500, and had a shot to win at the white flag. Johnson's take on Danica Patrick? door, whatever environment takes place on the track, at these speeds, she was very comfortable. "Held a great wheel. Was smooth and predictable. Took advantage of runs when she had them. "She did a really good job. "It was just another car on the track that was fast. That's a credit to her and the job she's doing." "This style of track really suits her," Johnson says. 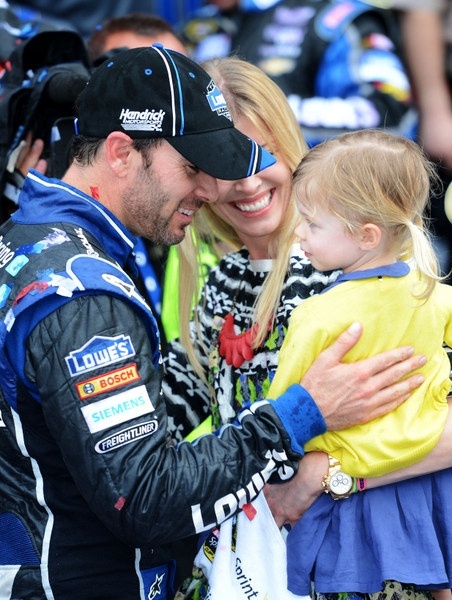 "When we get to the other tracks, she has a tall learning curve ahead of her." Having the lead, he says, was key. "Everybody who's won down here, the leader was in pretty good shape. "I was looking closely at Greg Biffle, waiting for him to come with a run. "Then Earl (Barban, Johnson's spotter) said Junior had the run. I thought that was great, because he was probably going to stall out next to Greg, and I was going to be up there all by myself in the lead. "Junior did have a big enough run to get by Greg, but I knew he didn't have enough closing rate to get by my side and do anything. So I felt good about things coming off four. "For me, the defining moment in the race was the caution coming out and being ahead of Brad. That gave me lane choice (for the final restart) and really control of the race in the closing laps. "Plate-racing has been tough on our team the last few years. So happy to get through it all. "I felt like I was sitting on something all day and was just ready to have some fun when it counted. And it did." Submitted by Henry on Tue 02/26/2013 - 05:28. Bad luck at plate tracks? In his rookie year 2002, wasn't he the point leader at Talladega when he was accidently? clobbered by Mark Martin when he was on the front row? ON THE PACE LAP!!!! But didn't he have the good luck of the world when he was driving championship fleet of cars of Jeff Gordon?? No r and d, no loose bolts, no "tall learning curve", was it just turn the key (oops flip the switch marked with a red arrow) and drive? Luck evens out I guess. I'm getting on his case and I'm a fan of his in Chandra's home town, Muskogee, Oklahoma, USA!!! PS The lead car in the draft has ALL the advantage, make the front end as aero as a 1968 Torino and I betcha you will see passing big time. Or have the cup guys run truck bodies at D and T. The inside line could get up to the leader for just a few seconds and then the brick wall of air would take over, plain as day here. They run 190 trap speed on the cookie cutters? Mark me down for the golf tournaments those days. Oh, and put the big bump going into three at Charlotte back!!!! Put some bumps in so they can run springs on the front of cars again!!!! Submitted by Bob on Tue 02/26/2013 - 05:32. I watched the "gen 6" car at Daytona and my opinion is YAWN! If we are going to watch a 500 mile conga line I'll find something else to do with my Sunday. How is Brian France going to fine the fans for being critical of the new car? OH! YEA! boring racing is how.